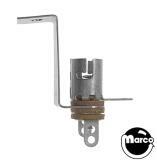 Quality lamp socket fits small bayonet bulbs such as #44 and #47. Large twist-in socket for #906 wedge base lamps. Lamp socket fits #44 and #47 lamps. Staple down style with lugs.